The second Brigid’s Way walking pilgrimage will take place later this month. Walkers start at Brigid’s Well in Faughart near Dundalk Co Louth on 28 June and nine days later, on 6 July, arrive in Kildare. The walk, or Irish *camino as it has been described, is the brainchild of Karen Ward, RTE’s Health Squad and BBC’s Last Resort and Dolores Whelan, Celtic spiritual teacher and author of Ever Ancient, Ever New: Celtic Spirituality in the 21st century. Karen Ward told CatholicIreland.net that just as the Camino de Santiago is popular among Irish people because it is exotic to them, Brigid’s Way attracts people from abroad to Ireland. Nine Americans and one Australian have booked for this year and organisers are appealing to Irish people to book at once as accommodation needs to be arranged. “Last year one of the Australian women said it was very much a coming home and honouring her ancestors. For everybody there is a spirituality connection. 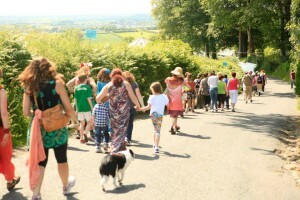 We were surprised because we put it out there to walking groups, to Sunday strollers, and obviously to Catholic St Brigid people, but also people of any spirituality,” Karen Ward told CatholicIreland.net. Last year, 50 people participated at various stages of the walk. This year a core group of 20 have booked for the full nine days and 40-50 people are joining in on the start and finish days. The weekends will also see a boost in numbers. A community has also grown up around the walk with volunteers running the bookings, providing cars for carrying the luggage between stages, and keeping the website and Facebook and Twitter updated. “That was very much Brigid’s style in her community. She had an abbey with the whole community. All her legends and myths were about a group of people working in harmony and we can see that, and that has been a real blessing and gift for us,” said Karen Ward. Karen Ward and Dolores Whelan tell the story of the founding of the route stating that there is no such thing as coincidence. On St Brigid’s Day 1 February 2012 they heard Anthony Murphy (co-author of Island of the Setting Sun) speak about the position of stars in the Cygnus Constellation and a corresponding alignment that runs through some primary sacred places in Ireland, connecting Faughart in Co Louth with Kildare. It seemed to them that Brigid’s pilgrim path, which linked these two prominent places of Brigid devotion in Ireland, was unfolding before their eyes. The felt encouraged to rekindle this ancient pilgrimage path. The Brigidine Sisters, who also dreamed of such a pilgrimage, get involved at the end with the ‘Walk a Mile for Brigid’. This also happens on the first day and anyone who is sponsored will put the money they raise towards the Brigid of Faughart Festival. For the final stage those sponsored raise funds for the Brigidine’s new Solas Bhride centre due to open in Kildare later this year. The pilgrimage winds its way through quiet rural landscapes. Pilgrims will visit sites of spiritual significance including Knockbridge, Hill of Slane and Hill of Tara and experience the magical landscapes of Donaghdee Forest Park and Robertstown along Grand Canal, en-route to Brigid’s monastic city in Kildare. The walking will be leisurely, taking in 10-12 miles per day. 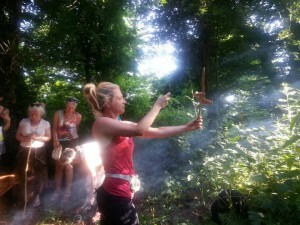 It will involve scheduled and spontaneous ceremonies and an opportunity to learn about the ancient traditions and wisdom associated with Brigid, the goddess and saint, and how she stands at the heart of the Celtic Spiritual tradition. Dolores and Karen have facilitated pilgrimages to sacred places in Ireland, Scotland and Peru for many years and both hold a strong desire to revive the ancient art of pilgrimage walking, once a central spiritual practice in Ireland. They believe that this practice allows people the time and space to step out of their ordinary lives and make contact with their inner world and find insights and wisdom that will support their life journey.